The Mendocino Fire Complex, which is comprised of two separate fires burning in close proximity in Lake and Mendocino Counties, has become the state's largest wildfire on record. The details: The Mendocino Complex was just 34% contained as of Tuesday morning, and it's likely that it will continue to expand as a heat wave and extremely dry conditions remain in place through the week. 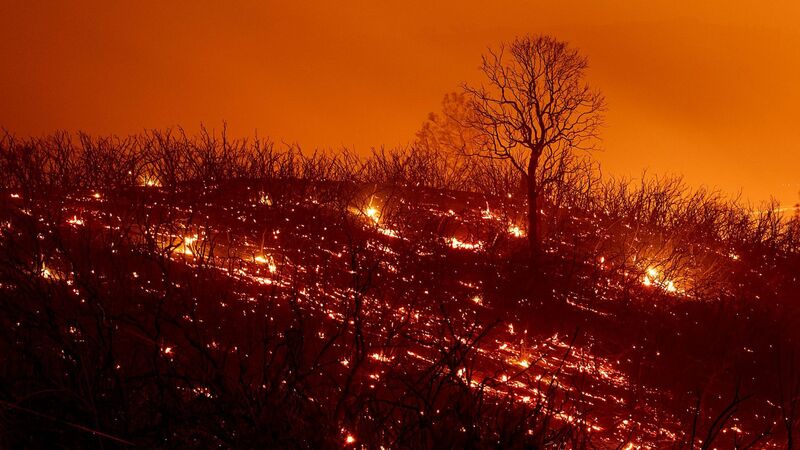 The Mendocino Complex is about 19 times the size of Manhattan, and about 1.25 times the the size of Dallas. The big picture: At 290,692 acres, the Mendocino Complex has eclipsed last year's Thomas Fire, which set the record at 281,000 acres. Although President Trump has repeatedly blamed state water allocations for the severity of the fires, experts say that a combination of decades of fire suppression policies combined with expanded development in fire-prone areas, along with climate change, is making wildfires burn hotter, longer and grow larger in California. It's especially noteworthy that the Mendocino Complex has set the record outside of the typical peak of the wildfire season in California, which occurs in October and November, before winter rains arrive. Likewise, the Thomas Fire burned during the winter last year, which was also outside the historical norm. Fourteen of the top 20 fires in California history have occurred in the last 10 years. The bottom line: Although climate change does not "cause" a specific fire, study after study has shown that global warming is already making the West's wildfire challenges much worse, by lengthening fire seasons and raising the odds of more days with extreme fire danger. As the climate continues to warm, extreme heat events and drought are increasingly likely in the West, making wildfire conditions even more dangerous.